Aga Khan Higher Secondary School for Girls, Hunza, Pakistan. A young girl at the Aga Khan School Booni, Chitral, Pakistan. 54% of the 27,000 AKES,P (Pakistan) students are girls. 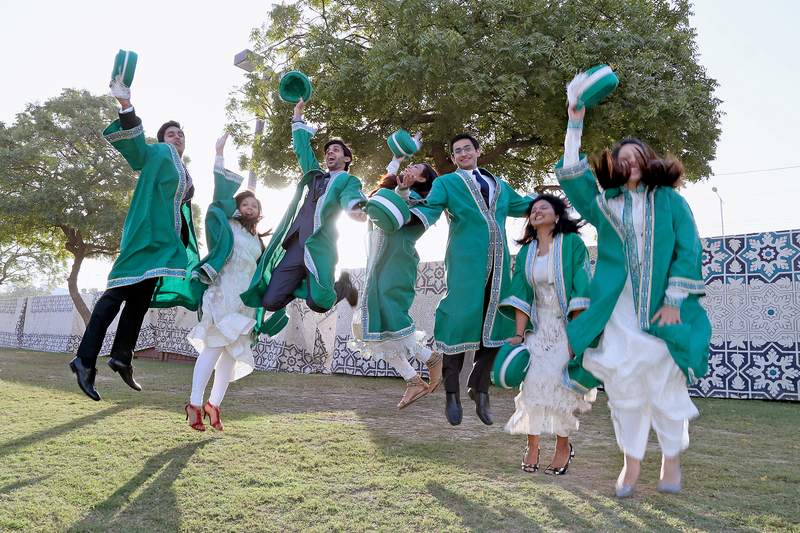 Students celebrating their graduation at the Aga Khan University Convocation Ceremony in Karachi. The Aga Khan University’s Medical College in Karachi, Pakistan. Education activities pre-date the existence of AKDN institutions, going back to the creation, by His Highness the Aga Khan’s grandfather, Sir Sultan Mahomed Shah, of community-based literacy centres for girls in villages scattered across the remote Karakorum Mountains in the late 1940s. In 1946, to commemorate Sir Sultan Mahomed Shah’s sixty years as Imam (spiritual leader) of the Ismaili Community, Diamond Jubilee Schools were established for girls across Gilgit-Baltistan and Chitral in Pakistan. Today, the education activities of AKDN extend from early childhood development to operating the country's leading medical university. Its programmes have reached tens of thousands of teachers and millions of students. Children learning the piano at the Sultan Mohamed Shah Aga Khan School in Karachi. The first school of the Aga Khan Education Service, Pakistan (AKES,P) was established in 1905 in Gwadar, Balochistan. Over a century later, it operates 160 schools and 4 hostels in Gilgit-Baltistan, Chitral, Punjab and Sindh, mostly in the rural areas. With a diverse student population, these schools range from rural schools with less than a 100 students to large urban schools. These schools cater to the educational needs of over 40,000 students from Early Child Development (ECD) classes to the higher secondary levels. With over 2,500 employees, of whom over 1,600 are teachers, AKES,P also gets support from over 2,000 volunteers. In Gilgit-Baltistan and Chitral, the first AKES,P schools were set up in the 1940s; since then they have contributed significantly to the increasing rates of literacy and socio-economic development in these mountainous and ecologically fragile regions of Northern Pakistan. It currently operates 152 schools in Gilgit-Baltistan and Chitral, providing quality education to over 27,000 students, of which 54% are girls. Through these efforts, it continues to play a critical role in women’s development throughout Gilgit-Baltistan and Chitral. In the Southern Region, AKES,P operates four schools in Karachi, three schools in the semi-urban areas of Sindh and one in Hafizabad, Punjab, with a total enrolment of over 8,900 students. All these schools follow the National Curriculum and place special emphasis on the teaching of English, Mathematics, Science and the use of Information and Communication Technologies. Many of them are affiliated with the Aga Khan University Examination Board. AKES,P’s journey, from providing ‘access to education’ to ‘provision of quality education’, entails a number of innovative steps. From time to time, it has pioneered change and improvement in the quality of its services by introducing creative models of schooling, professional development, assessment and community participation – for instance, the community-based school model. Currently, the institution supports over 210 community-based school endeavours throughout Pakistan. Notably, the alumni of these schools have made their way to high-profile institutions such as the Institute of Business Administration, Lahore University of Management Sciences, Aga Khan University, DOW University of Medical Sciences, London School of Economics and Oxford University, to name just a few. Through an excellent blend of curricular and co-curricular offerings, these schools have proved instrumental in developing the students’ confidence, nurturing their creative abilities and leadership potential, and challenging them to be intellectually inquisitive and socially conscious. The Aga Khan Foundation works in partnership with governments, school faculties, parents and communities to develop affordable, innovative solutions that raise the quality and accessibility of their public school systems. 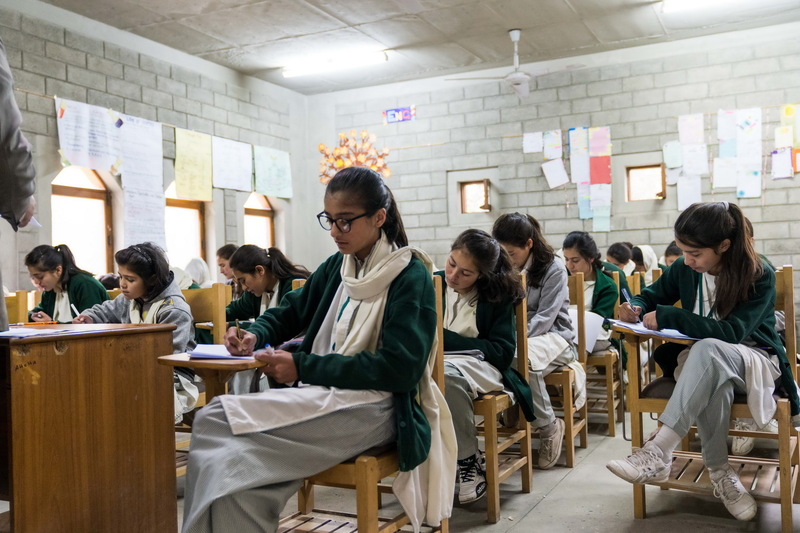 In Pakistan, it is piloting an education improvement programme in 151 primary and secondary schools across the remote areas of Gilgit-Baltistan and Chitral. Interactive learning methods known to transform classrooms and student learning achievements are reaching over 12,500 children and 650 teachers. The Examination Board of the Aga Khan University is a national board of intermediary and secondary education that offers qualifications both in English and in Urdu for the Secondary School and Higher Secondary School certificates. In 1995, 16 private schools in Pakistan wrote to the Aga Khan University (AKU) to express concern about the poor quality of secondary education in the country. They identified the country’s testing system as a major problem and asked AKU to establish an independent examination board. In Pakistan, graduation from secondary school and admission to university is contingent upon passing a test set by one of a number of regional examination boards. At the time, these boards were all government entities. The schools’ request launched a process that culminated in AKU establishing Pakistan’s first private Examination Board, in 2003. While existing examinations largely rewarded memorisation, the AKU Examination Board has taken a different approach, developing exams based on Pakistan’s national curriculum that reward critical thinking and problem solving. At the same time, the Board works closely with schools to provide training, learning materials and appropriate syllabi that help teachers to move away from rote instructional methods and develop students’ analytical skills. The result is graduates who are better prepared to succeed at university and in intellectually demanding occupations, and to make a positive contribution to society. The Board uses a highly reliable, secure and transparent electronic marking system – the first of its kind in South Asia. Not only does this prevent cheating, it allows the Board to provide meaningful feedback on performance to schools, student by student and question by question. Today, the Board is recognised as a role model, and has assisted government examination boards in upgrading the skills of their staff and their practices. The Aga Khan University’s Examination Board trains more than 1,000 teachers every year. Over 30,000 students have graduated from Board-affiliated schools in the last 10 years. The Aga Khan University Medical College in Karachi, Pakistan. 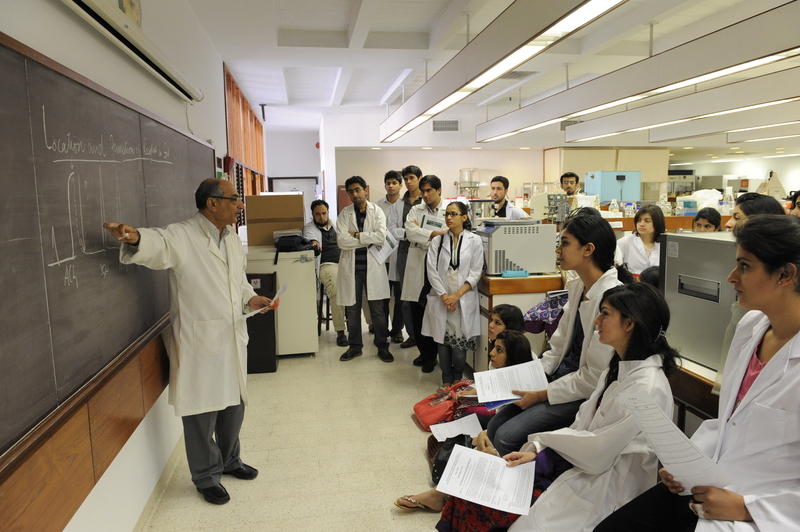 The Aga Khan University (AKU)’s Medical College is ranked #1 by Pakistan’s Higher Education Commission. It offers the MBBS degree (the equivalent of the North American M.D. ); 33 residency and 27 fellowship programmes; three master’s degree programmes; and a PhD in health sciences. The University offers the country’s only fellowships in 12 specialties. AKU’s School of Nursing and Midwifery has been a national leader for more than 30 years and has played a key role in improving the reputation and practice of the nursing profession. AKU’s School of Nursing and Midwifery was the first nursing school in Pakistan to be affiliated with a university, and the first to offer a Bachelor of Science in Nursing, a Master of Science in Nursing and a Post-RM Bachelor of Science in Midwifery. The School’s impact on the development of nursing in Pakistan has been remarkable. Its curriculum has served as a template for the national nursing curriculum and its focus on community health has inspired other schools to follow its example. AKU's Institute for Educational Development in Karachi, Pakistan. 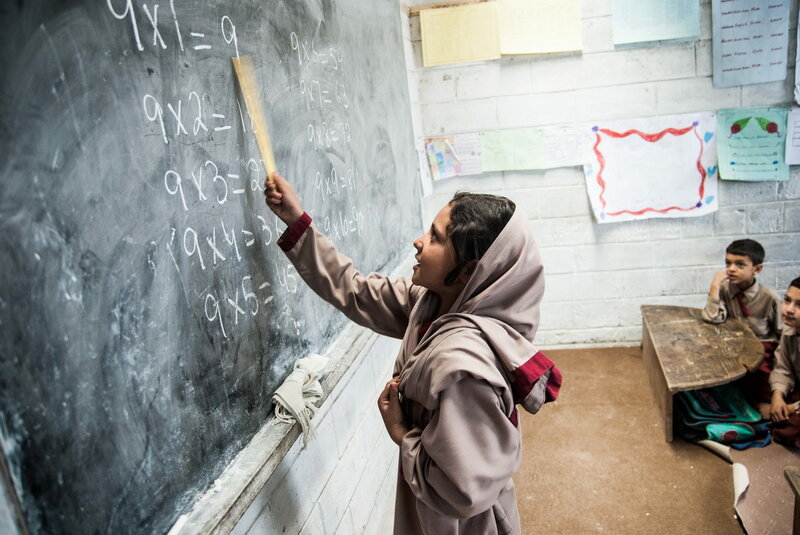 In Pakistan, more than 34,000 educators trained at the Aga Khan University Institute for Educational Development (AKU-IED) are transforming classroom instruction and school management, replacing traditional methods of rote learning with a student-centred approach that builds problem-solving skills and encourages independent thinking. Established in 1993, IED is a national resource, and its impact on policy and practice has been significant and widely acknowledged. The National Education Policy of 2009, the national teacher professional development framework, the Sindh Education Sector Plan, curriculum reform in Sindh and at the national level, and textbook development in Sindh all bear the Institute’s imprint. IED was instrumental in establishing numerous associations of educational professionals that are active providers of learning opportunities for their members. An independent, external review of the Institute’s first 15 years found that “IED represents a unique, effective, sustainable and dynamic contribution to education reform for developing countries”. The review’s authors also stated that teaching, research and service “have never, in our experience in the developing world, been so strategically developed and extensive as at IED". To date, the Institute has awarded nearly 1,400 degrees and diplomas. IED recently completed a multi-year project funded by the Canadian government and the Aga Khan Foundation, known as Strengthening Teacher Education in Pakistan. 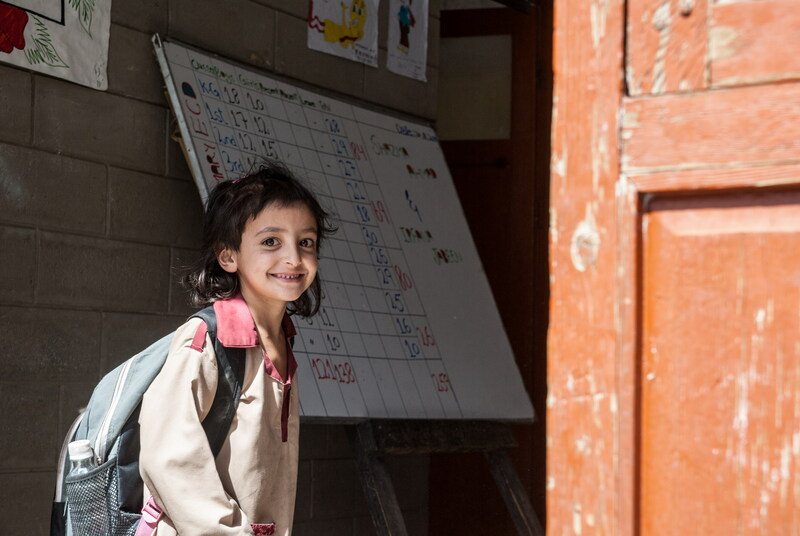 Over six years, it trained 14,000 educators, community leaders and parents across more than 1,650 public primary schools and teacher education institutions in Sindh, Balochistan and Gilgit-Baltistan, benefitting more than 300,000 students. In northern Pakistan, the Institute recently worked to improve access and educational quality in Gilgit-Baltistan under the Educational Development and Improvement Programme, funded by the Australian government. The Institute’s research focus has been a key driver of its success and is amongst its most distinctive attributes. To date, it has granted over 1,400 PhDs, Masters and Advance diplomas in education. In Pakistan, half of all IED diploma and degree recipients are women.